The On-Stage LED204 Dual Head 4 LED Clip Light features intensity adjustment. 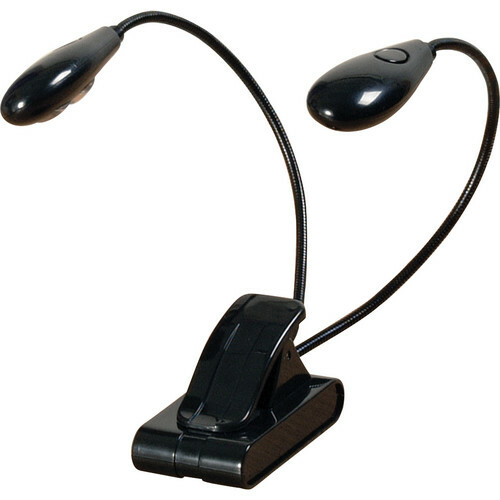 Each of the gooseneck-mounted lamp heads feature a pair of high-intensity white LEDs. A 3-way switch on each lamp head lets you choose 2 LEDs, 1 LED, or off to suit your personal lighting needs while simultaneously controlling spill-over into the audience or other musicians. The strong clip-on design easily attaches to your music stand and the compact base can also sit flat on a desktop. It is powered by 3 AAA batteries, the LED204 Clip Light can illuminate for days without fading. Box Dimensions (LxWxH) 7.1 x 4.7 x 2.3"
LED204 Dual Head 4 LED Clip Light is rated 4.8 out of 5 by 4. Rated 5 out of 5 by bob from Perfect LED stand light I'm a professional musician using this LED stand light for reading music at gigs that have low light situations. The great thing about this light is that it has four bulbs, two for each page of music which is entirely adequate for reading. The clip is strong and works on almost any music stand and the item itself weighs next to nothing and can be slipped into an instrument case of even the interior vest posket of a tuxedo. Smart design! Rated 5 out of 5 by RetroDuo from Great light, for a great price The LED204 was just what I was looking for. Compact, easy to use and produces plenty of light. We have been using the lights at rehearsal and will surely used them at our next gig. We play music at clubs, where the lighting is sometimes poor and these lights should help a lot. Rated 5 out of 5 by vlmjr from Two heads are better than one! I recently purchased several of the single head versions of this light. Our keyboard player, who is on the darkest part of the stage, could still only see one page of music at a time. So yes, the dual-head light was the obvious solution. It works great, just like the single head version, with enough light to give visibility but not make the stage look like an airport runway. Keyboard player is happy again!